7937 Train Station is a City Trains set released in 2010. It contains 361 pieces to construct a train station, taxi and 4 Minifigures; a Train Conductor, Taxi Driver, and two Passengers. It also includes four train track elements Straight Rails. The train station features a small shop; with drinks, a sliding door and a computer, a footbridge, a ticket machine, 2 seats, a timetable and some street lamps. The design idea for this set seems to be based on the former 7822 Railway Station from 1980. The tracks are not compatible with usual 9V trains. There is a sticker in this set that says "NEW truck in Town" with a picture of 3221 LEGO Truck. This set is sold in the US as a Special Edition set at the LEGO Store and Toys R Us. The taxi has a small boot which can hold two suitcases. Some of the destinations on the timetable are: Dublin, London and Madrid. This is a description taken from LEGO.com. Please do not modify it. 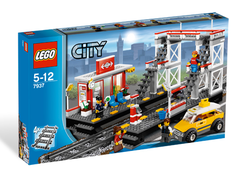 (visit this item's product page) Get on the inside track with the new LEGO® City train station! The railroad station's open, service has begun and it's teeming with activity as passengers check train timetables, buy tickets and board their trains. To cross to the other side the passengers take the pedestrian bridge. The taxi waits to take passengers to their final destination. Includes 4 minifigures: 1 train driver, 1 taxi driver, and 2 travelers. Note: Tracks are not compatible with LEGO 9V trains. 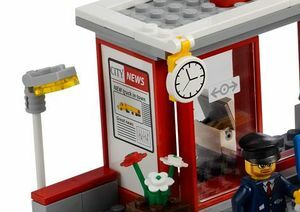 Facts about "7937 Train Station"
Get on the inside track with the new LEGO® City train station! This page was last edited on 9 February 2019, at 22:54.